Proper Manners and Etiquette will get You Ahead in Life! Added by Indo American News on August 4, 2017. Chase Untermeyer speaking about public etiquette at the early morning event at the HESS Club. In a short 30-minute presentation using PowerPoint slides and a peppy narrative, Untermeyer delivered a trove of ideas for being an effective communicator and sending the right message in public spaces. He based his observations on years of being in the limelight in government, teaching and private business where he interfaced with officials and the public. 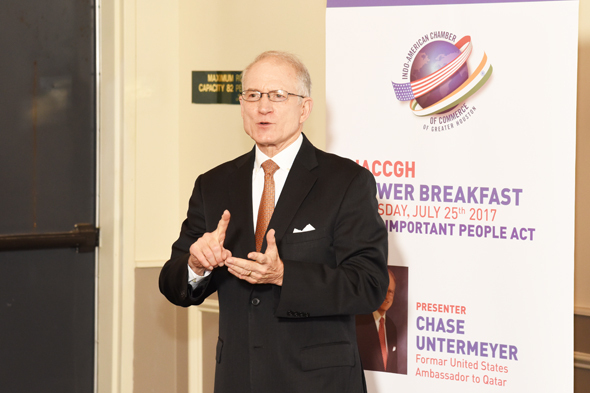 And here he was, on Tuesday, July 25 at the HESS Club in the Galleria area as a featured speaker for the Indo American Chamber of Commerce of Greater Houston’s Power Breakfast series, sharing his experiences and gently guiding two dozen attendees in the etiquette of public presence. He has captured many of these experiences and the observations upon which he has formed his ideas in his latest book released in 2015, “How Important People Act: Behaving Yourself in Public”, which was available for purchase at the breakfast event. IACCGH Executive Director Jagdip Ahluwalia welcomed the guests and former president Sanjay Ram gave a brief introduction of the speaker. Untermeyer, 71, is no stranger to the halls of power from which he has had a bird’s eye view of other public figures. Born in Long Branch, New Jersey, he graduated from Memorial High School in Houston in 1964 and later from Harvard University in 1968. He worked on George H.W. Bush’s congressional campaign in 1966. He joined the US Navy and served as an officer during the Vietnam War on the USS Benner as an aide to Rear Admiral Draper Kauffman. Returning to Houston, Untermeyer was a reporter at the Houston Chronicle and was elected as a Representative to the Texas House till 1981. He became an executive assistant to President George H.W. Bush, then served as an Assistant Secretary of the Navy and finally as Director of the Voice of America. He returned to Houston as the Director of Public Affairs at Compaq Computers and later worked as a VP and professor of public policy at UT Health Science Center till 2004 when he was appointed as US Ambassador to Qatar (for three years) by President George W. Bush. He has also been on the boards of several high-profile local organizations. He illustrated his comments with pictures and cartoon about being aware that you are in the public eye, like when former Vice President Joe Biden made a gesture to make eye contact with an acquaintance while sitting behind President Obama delivering a speech to Congress. Untermeyer said there were four “C’s” to follow: Composed, Comfortable, Confident and Considerate. He prescribed two rules: dress well to convey authority and look at the person you are conversing with to show interest in them. And he handed out several tips for effective communication. For those who are afraid of eye contact, he suggested looking at the bridge of their nose. And, if you have to attend a long, tedious speech, to avoid dozing off, sit on the edge of your seat. For those afraid of public speaking he suggested not reading verbatim from PowerPoint, but to be short and use simple, single syllable words to make a strong impact. At the end of his presentation, Untermeyer took a barrage of questions from the audience, all of whom agreed that these interpersonal skills were lacking from most educational curriculums at colleges, leaving many graduates ill prepared to effectively communicate their thoughts.